How tax dodgers see their dodging as a fight against evil! Taxpayers' Alliance report "The Single Income Tax"
The key factor that drives companies and conmen who rip-off people is greed. The reason banks rarely steal candy from babies is not that they care for babies, it is that they don't care for candy. But have you ever wondered why some people with pots of money strive so hard to dodge tax? And why a huge multibillion pound industry of lawyers, accountants, bankers, politicians and lobbyists - many of them decent people - has grown to support them? Leaving a £35 billion (estimated by some to be as much as £120 billion) hole in public finances that has to be filled by higher tax and cuts in services for everyone else? Is it simply greed? An insight into their reasons was published in May 2012 when the Taxpayers’ Alliance, backed by the Institute of Directors (who should know better), released a 420 page report, “The Single Income Tax”. In this report, apart from the stuff about why taxes on the wealthy should be radically cut, we also see why tax-cutters are so fervent. So fervent they are prepared to tell fibs and consign others to economic, mental and physical ruin by withholding their taxes thereby impoverishing public services. It is because they believe they are fighting wickedness! And by characterising what they do as a fight against wickedness it gives them licence to fight without scruple. Throughout history powerful people have argued that the things they do are a battle against wickedness. Like the crusaders centuries ago invading the Holy Land, claiming to be doing god’s work, with the coincidental benefit of bringing them great wealth. The head of the Cistercian monks in the thirteenth century, during a war between types of Christians, when asked how to distinguish between the good and the bad on capturing the citizens of a city in France advised “Kill them all. God will know his own”. · Higher taxes are morally corrosive. · Ethical corrosion in government. · War between social groups. · Taxes reduce human prosperity. Perversity, corrosion, immorality, slavery and social war – what’s there to like? Thereby the report asserts that dodging tax is not for the dodgy. Tax dodgers are actually dodging wickedness. And the only way to stop the dodging is to abolish the taxes - hence the report. 1. "Taxes should be cut to 33 per cent of national income"
According to government figures, taxes in recent years have hovered around 37% of GDP. Cutting this by 4% would take over £22 billion out of government coffers at a time when, in an attempt to save money, we are compromising our security with cuts to armed forces and police, our health with cuts to healthcare, our brains with cuts to universities and schools, and our old age with cuts to pensions. 2. "Marginal tax rates should not exceed 30 per cent, and the personal allowance should rise to £10,000"
Note that ‘marginal tax’ is not the same as ‘income tax’ – as it includes all taxes such as National Insurance. This would reduce top rate taxpayers' tax rate by over a third, dropping to 30% from 47% (for the year 2012-13, 45% income tax + 2% National Insurance). Those on average salaries would see a much smaller drop from 32% to 30% (for the year 2012-13, 20% income tax + 12% National Insurance). A massive tax cut for the wealthiest, not much change for the rest of us. 3. "Taxes on capital and labour income disguised as business taxes should be abolished, and replaced with a tax on distributed income"
In case you were wondering, this means abolishing corporation tax. No, really it does. The report claims that “The fairest way to tax people on their income from capital is to abolish all corporate taxes entirely and tax the income as and when it flows to people.” Which means no tax on corporate profits – just tax dividends paid to shareholders and interest paid to lenders. 4. "Transaction, wealth and inheritance taxes should be abolished"
Transaction taxes, e.g. 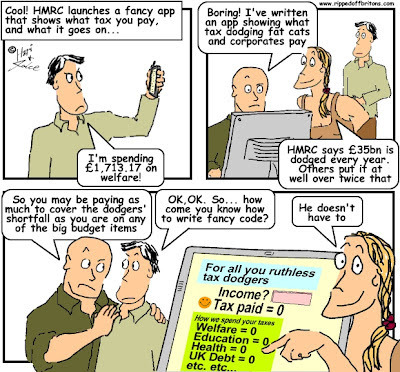 stamp duty, wealth and inheritance taxes are largely taxes on the wealthy. Of course the wealthiest find ways to dodge these taxes in any case. Multimillion pound houses are sold via companies to avoid the 5% stamp duty on property transfers. The ‘seven year rule’ and properly created trusts enable the wealthiest and best advised to avoid inheritance taxes. Of course, if these taxes were abolished, there would be no need to dodge them. 5. "Other consumption taxes need to stay for now, but transport taxes should be cut"
Consumption taxes – such as VAT – hit the poor much more than the wealthy, so it is no surprise the Taxpayers Alliance are relaxed about them. The assumption that the rich consume more and therefore pay more consumption taxes is false. Consumption tax is paid on the flow of cash, and while the wealthy have almost all the wealth ordinary people have most of the cashflow. The reality is most ordinary Britons consume (i.e. spend) their whole month’s salary in a month – effectively paying 20% VAT on much of their income. The wealthy consume a fraction of their monthly income, paying VAT only on this fraction, salting the excess away. Consumption taxes are already a ‘hidden in plain sight’ tax avoidance measure for the wealthy. On the other hand, cutting transport taxes – car tax, fuel tax, air passenger duty and the like - benefit you more the bigger your car, the more you drive it, and the more you fly. 6. "Local authorities should raise half of their spending power from local taxes"
The result will be to reduce the contribution paid by affluent areas to low income areas. Get the poor to pay for themselves. So there we have it. Now we know: tax dodgers, their consultants in the tax professions, and their allies in Parliament believe they are on the side of the angels. Fighting the wickedness that is tax. And in that fight there are no holds, dodges, dives nor dissembling that are barred. As we hear their arguments about how giving them more will make us all better off, don't you believe it. In the last two decades Britain did get richer - but the riches went to the rich. If the government took this report seriously I think we should all move to Scotland and vote Yes on the independence. Lets call their bluff - no taxes mean no government and no public servants. Without the police and judiciary there would be anarchy and the rich (tax dodgers) rely on order to maintain the status quo (them staying rich) - Therefore the rich, faced with anarchy, would panic and pay up. Taxes are evil, as they only create bureaucracy and waste. Let everybody take care of themselves, as that is what they do best. All the above arguments are frivolous as they compare the situation of huge bureaucratic waste with gigantic bureaucratic waste. The real comparison is to be made between a world without all this government thieves and a world where they are held closely under control. Taking without the owners consent is theft except when it comes to the state (tax). People have been made wealthy by taxes on the people going back 1000s of years. Once we gained a voice in that process the wealthy changed tack and is slowly but surely transferring power to corporations. This is not about the good or evil of taxation but the evil of greed. The people are not responsible for introducing taxes. As usual it comes back to the few wanting power over the many rather than having to share or be answerable for their actions whilst people's labour funds it. It's appalling that our government is currently arranging the very process of transferring assets owned by the country and therefore the people into private hands so they do exactly what the Tax Alliance is advocating. This is being done clandestinely on the back of lies and manipulative PR whilst removing key important institutions from public control and scrutiny. There is no honesty about any of this and therefore no honesty amongst the 2 parties collaborating on it - indeed the Labour party also partially signed up to this under Tony Blair. He wanted the '3rd way' collaboration between state and corporate. This isn't good enough for the coalition they do not want the people to have any power or equality with them. So what is the real evil? A concept created by those in power to maintain their power - taxes or a concept created by those in power to maintain their power - corporate. Makes you think a bit hmmm? That's how the dishonest reconcile their dishonesty to themselves - by compounding the dishonesty with themselves by pretending that paying their dues as part of society is theft, when the real theft is dodging paying their fair share.